membership of the New Norfolk Cricket Club. STAR recruit Jason Rigby cleaned up at the New Norfolk Cricket Club's annual trophy presentations and dinner, taking home a total of seven awards including the Lyn Harris Memorial Trophy for the first grade best allrounder/club champion. Rigby won the award with a total of 963 points, 236 clear of runner-up Nathan Eiszele on 727 points. Rigby's bag of awards comes on the back of the Red Caps announcement that the talented cricketer will be club's senior coach for 2017/18. Paired with the announcement of Seb Wishart as senior assistant coach and premiership league recruit Matthew Bowden (ex Lindisfarne) as development coach, the Red Caps are in for another big season. More than 70 players, members and guests attended the evening which was held at the NNDFC on May 14. Another highly regarded award is the Charlie Eiszele Perpetual Trophy for best club person which was won Tammy Hill, one of the club's most dedicated workers. Tammy is the wife of club president Jamie Hill and they make a great team. 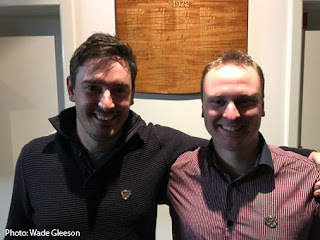 Life memberships were awarded to Chris Ashcroft and Nathan Heron who have given great service to the club on and off the field over a number of years. Nathan joins his brother Rohan and father Glenn as life members. Thank you to Jamie Hill for inviting me along to what was a very well planned and put together evening, it was much appreciated. Congratulations to all trophy winners. Life membership: Chris Ashcroft and Nathan Heron.